Danelectro Wasabi Forward/Reverse Delay. Made in china, 2003. Another prime example of Danelectro’s ability to create unique box designs. There are five designs for this series.. Or we should possibly talk about Wasabi as a separate brand. But we won’t. 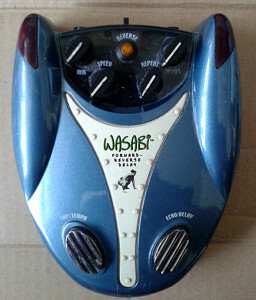 Everything about the pedal simply screams Danelectro, even though the Wasabi was intented to be a new brand altogether. You may or can think or make what you want of it. I’m still calling these Danelectro Wasabis. Complex SMD board with components smaller than usual. 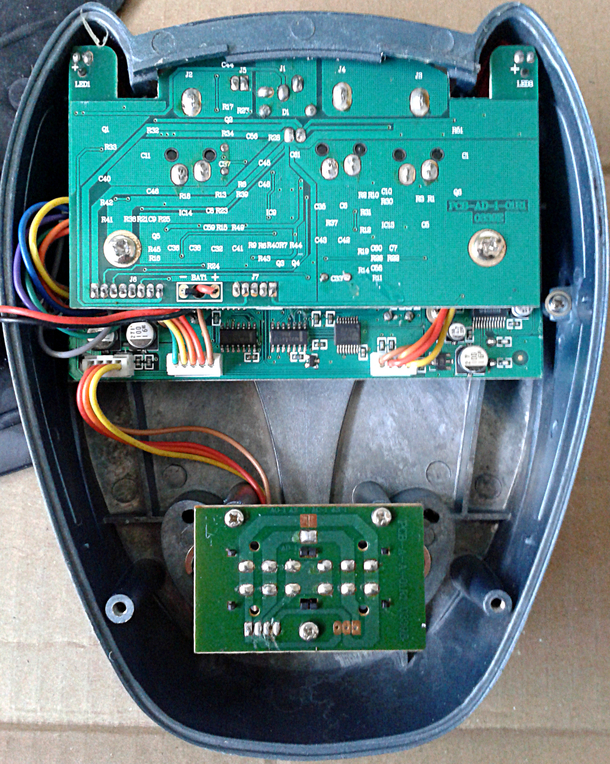 Well, the enclosure could have housed bigger boards, but battery slot always takes its share of the room available. Lifting the jack board which also houses part of the design, we have several big chips close to each other. I think my desktop computer’s motherboard has lower component density than this one. Complexity grows with added features in linear manner. We have standard digital delay with your everyday controls, delay mix (from all dry to all wet), delay time (called “speed”?! and this one goes from 0 ms to 3000 ms – that’s 3 seconds) and amount or repeats (from one to infinite oscillating space mass). 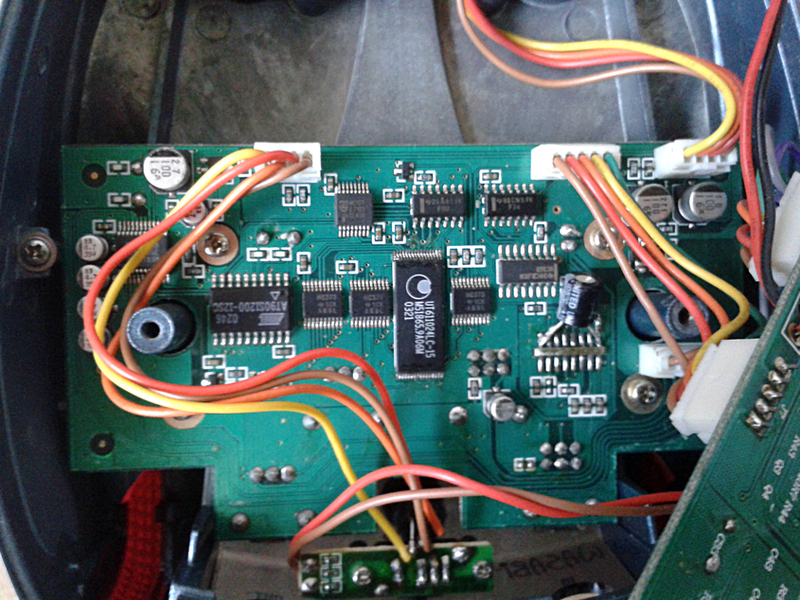 In addition to these rather standard controls we have Hi Cut, which cuts higher frequencies from every repeat. Not completely unlike the feature we find in Danelectro’s Reel Echo desktop/pedal unit. One push of a colorful button turn the repeats in reverse. Oh. Let’s not forget the tap tempo feature. Or in this case, a tap speed. This is a great addition to controls mentioned above. There’s one more thing. The input selector. We have different input level setting for humbuckers, single coils and general “off” setting. These settings set the input level to suit the guitar used. May be useful in those cases where one wants to use the delay with active pickups or after another device with too high output level. It’s not a competition to any high end delay box, but when these were available ten years ago, the bang for buck factor was pretty respectable. Could be better. In fact, a lot better. 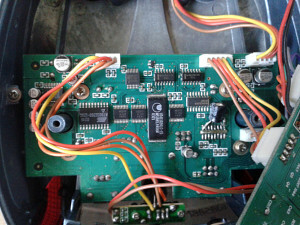 The features are very attractive, but the issues come with the sounds. To my ears the reverse mode is about as good sounding as the one found in Digitech’s X-series Delay. And that’s the best part. The raw, fast digital attack of the basic delay is nearly painful to listen to. Maybe even worse than the awful attack we hear on Boss DD-3. For drone/ambient folks, this makes a fine toy. And possibly for home guitarists as well. It could also be used as a shock effect when recording. But as a delay to be used daily on a pedalboard? No. Look elsewhere. Entries (RSS) and Comments (RSS). 34 queries in 0.210 seconds.